I have distinct memories of taking Cup Noodles for lunch in elementary school. I remember carefully peeling the lid back, but not all the way off, then adding the hot water before gently placing the paper lid back down. With my spoon resting on top to hold the lid in place while the noodles steeped, I waited patiently for the little dried corn and shrimp bits to rehydrate. After only a few minutes, although it seemed like much longer at the time, lunch was ready. There was always the challenge of untangling the mass of noodles while trying to slurp both broth and noodles at the same time. Having now spent a few weeks in Japan, I appreciate that ramen eating is a learned art – chopsticks in one hand, spoon in the other, with alternating slurps to enjoy all the flavours. For those hot soup lunches, I have Momofuku Ando to thank. After WWII, in his quest to show that “Peace will come to the world when the people have enough to eat” Ando founded Nissin, first manufacturing salt, and then in 1958, launching the first package of precooked flash-fried instant noodles, called Chikin Ramen. In 1971, the introduction of a waterproof styrene container created the Cup Noodles that have become a worldwide success. 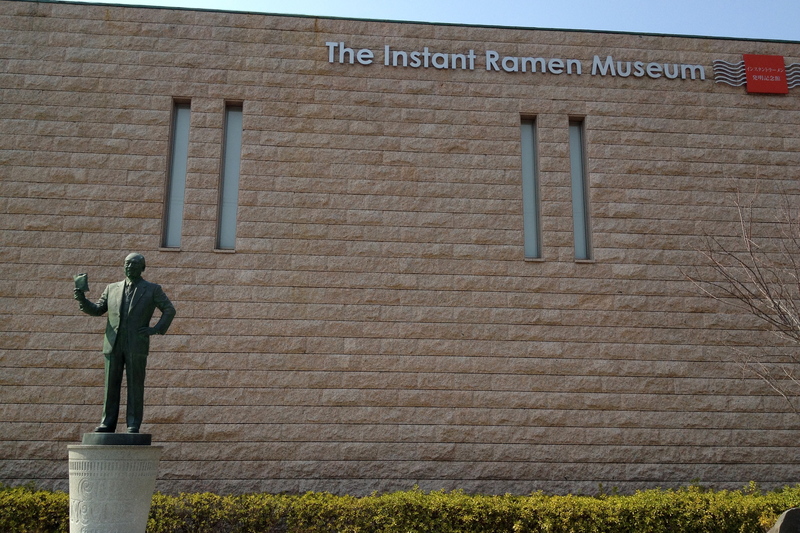 All of this started in the small city of Ikeda, which is about a 45-minute train ride outside of Osaka and home to the Momofuku Ando Instant Ramen Museum. Entrance to the museum is free. 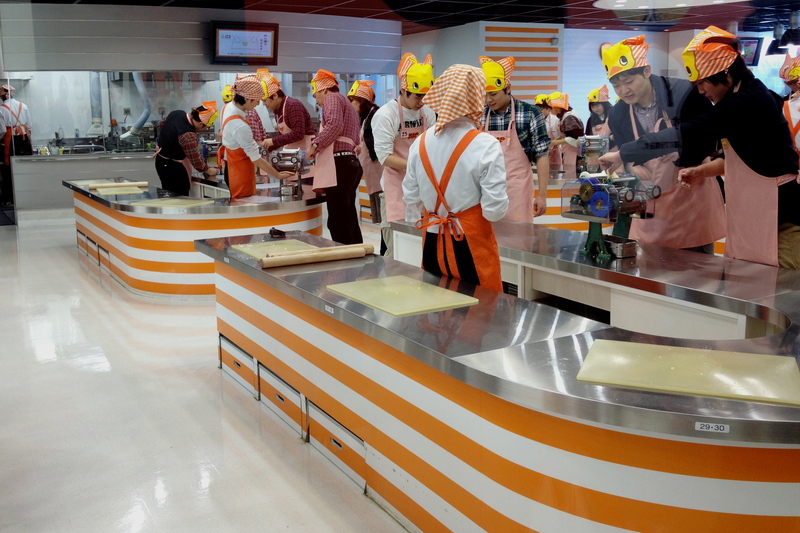 You can walk through the Instant Ramen Noodle Tunnel to learn about the history of Nissin and instant noodles, test your ramen knowledge at the interactive trivia tables, or rest inside the small theatre (appropriately designed in the shape of an oversized noodle cup) and watch a short movie about how the soups are made. If you book ahead, you can join a class to roll your own ramen noodles while wearing your very own chicken bandana (note: these classes book up way in advance; they were taking reservations for five weeks out when I tried to sign up). 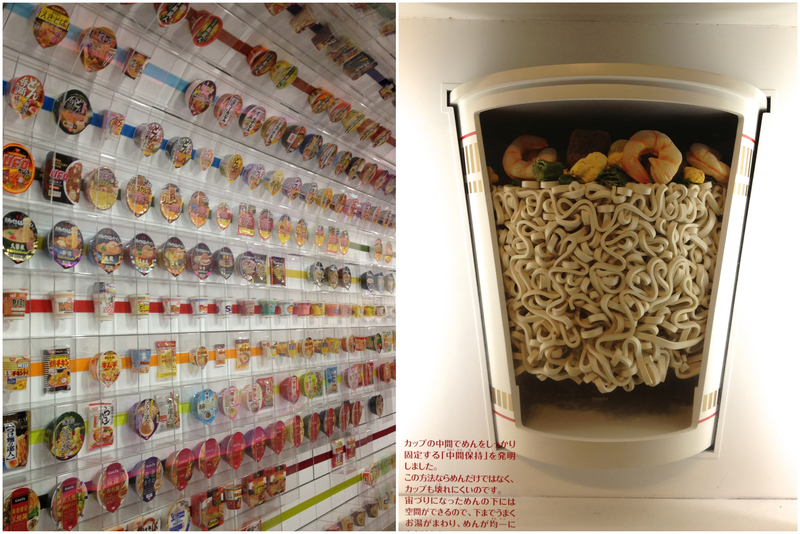 For those who are interested in more spontaneous fun, for only 300¥ (approximately $3.20 CDN) you can design your own Cup Noodles. This is not a task to be taken lightly. When faced with a blank canvas, the pressure is on to design something noteworthy. You may think this is kids stuff, but the day I visited, the museum was full of young adults, sitting quietly, carefully selecting colours from the markers provided, concentrating on their designs. Once satisfied with your artistic efforts, it is time to build your perfect Cup Noodles. 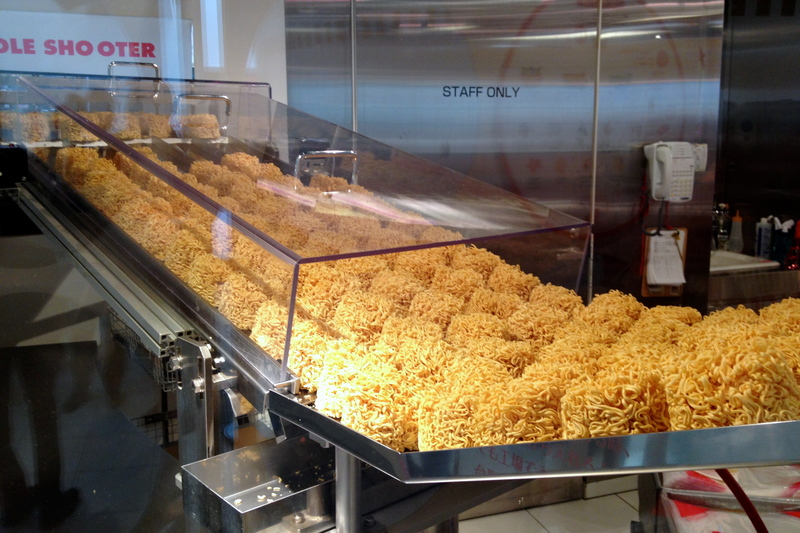 First you spin the Noodle Shooter to fill your cup with ramen. 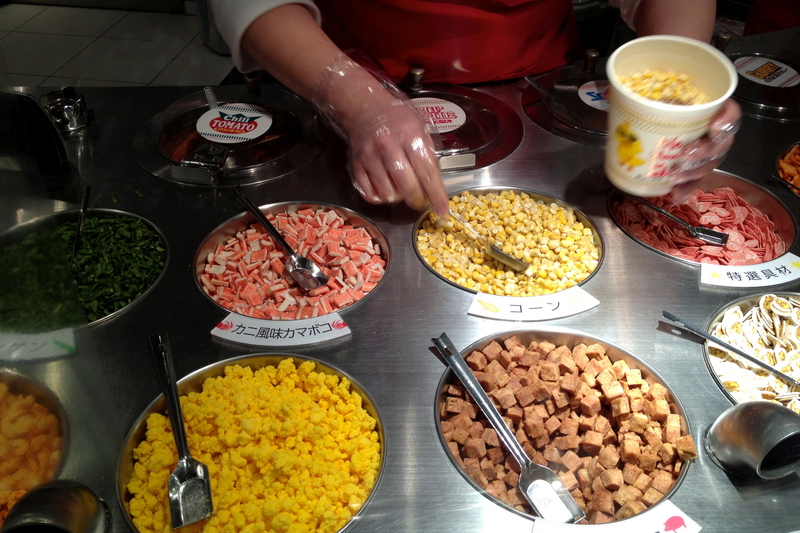 Next, at the flavour station, you select your seasoning (classic chicken, chili tomato, curry…) and add up to four toppings (chicken, pork, shrimp, egg, corn, green onion…). Then your cup is sealed with a paper lid and shrink wrapped for safekeeping. But the most important part still lies ahead. 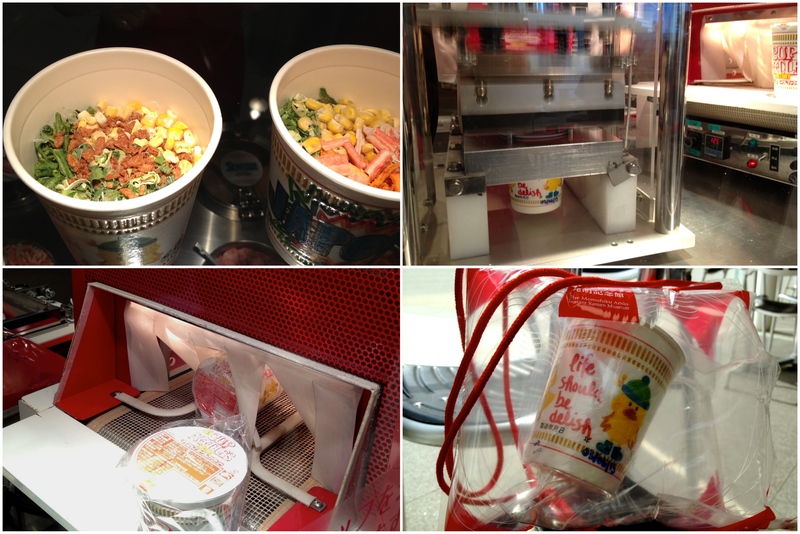 Once your personalized Cup Noodles is ready, you place it inside a specially designed plastic bag, complete with red string handle, which gets inflated to create a protective air pillow around your cup. The train ride back into Osaka, with passengers pointing and discussing your Cup Noodles design, is almost as much fun as the whole process of making it.